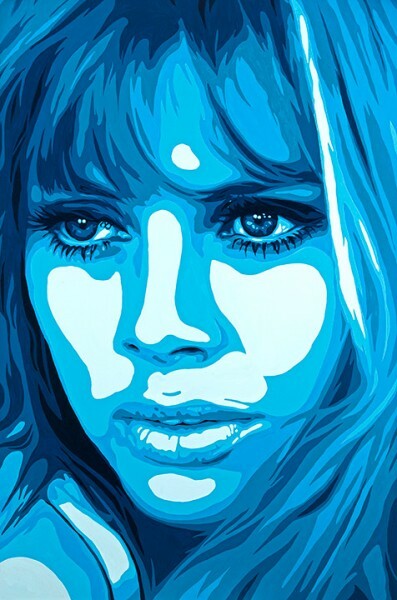 As I worked on the Britt Ekland painting, moving away from my favored palette of Prussian Blue to a more natural, turquoise coloring, I felt my approach similarly shifting in response. As I focused my attention on the eyes, gazing into the middle-distance with a vulnerability that bordered on the heart-breakingly stunning, I found myself taking a more analytical stance than usual. Looking into those eyes that I’d painted only moments before, I started to question the nature of beauty. Of course, I’m by no means the first to do this. Even in ancient Greece, Plato was asking the same questions, wondering whether there was such a thing as a universal quality of beauty, or whether it was, as the phrase goes, simply ‘in the eye of the beholder’ and only a matter of personal opinion. As I thought back to all the beautiful people I had painted over the years; Kate Moss, Brigitte Bardot,Catherine Deneuve, Jessica Stam; I started to look for a connection between them, some quality that they possessed that united them; that elusive quality of beauty. However, I found it impossible. Britt Ekland, and her unique brand of gamine innocence and coy sexuality, is very different to Brigitte Bardot, who used her beauty in a far more dominant, aggressive, forceful manner. Kate Moss possesses a defiant, charismatic quality which renders her beautiful; but Catherine Deneuve is no less beautiful for having a submissive style of beauty. However, if beauty was just a matter of opinion and was just ‘in the eye of the beholder’, then how could I find all these different types of beauty so equally compelling to look upon? Another big question, of course, is that of why we artists are so eternally obsessed with depicting beauty in our art. Reflecting upon my own work, I can testify that it goes beyond a simple aesthetic pleasure. Looking upon beauty is undeniably a pleasurable thing, but this has never really been my motivation. For me, I think it’s more a case of creating a ‘sensible image of the infinite’, to quote the historian George Bancroft. Art is, by its nature, infinite; designed to outlive the artist and continue through the years, unchanging, resonating differently with each different era of viewer. By creating art, we create something like the infinite, and by painting a beautiful subject, we capture that beauty and freeze it in time. Aesthetic beauty in people and in nature, is, by its very nature, a transient thing; in full bloom for a period of time, before gradually fading. Beauty in art is the opposite. Once sealed in paint, it is tied to the canvas for as long as the image endures. In our digital age, with artistic works now being stored extensively online in addition to existing in physical form, this could, quite literally, be an infinity. I think, to conclude, that this is precisely why I chose to paint Britt Ekland. Her style of beauty holds something of the immortal to it regardless of my painting her; it’s an innocent, instinctive beauty that radiates from deep within her. She was the perfect subject to select when focusing upon painting beauty in its rawest, most pure form. My portrait of her captures that special type of beauty, holding both a sense of the universal and of the subjective. It celebrates the immortality of beauty, without detracting from the fact that beauty is, in essence, a temporary, fleeting state.